Brunch Bird: Anyone Been to the University Club Lately? Anyone Been to the University Club Lately? 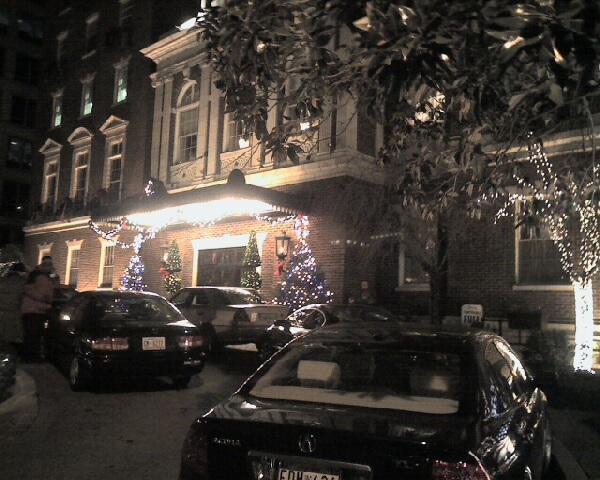 Could someone please explain to me what the University Club's Christmas lighting concept is? They've got the traditional white lights accenting greenery and red bows. But then they've also decked their august halls with blue and gold lights, and then piled oddly shaped topiaries with lights in a bilious shade of green. The Russian Embassy next door--with its white lights, greenery and red bows--could put up giant, inflatable matrioshka dolls and still look elegant by comparison. You know Ushakov and the missus are totally rolling their eyes every evening when the Griswolds next door fire up the display. LOL I almost wish the Russian embassy would put up giant inflatable matrioshka dolls. That might just be reason enough for me to move back.